The Sas-Vektor Adria 1002 was built in 2012 and is a fantastic motor boat for your next sailing holiday in Sukosan. 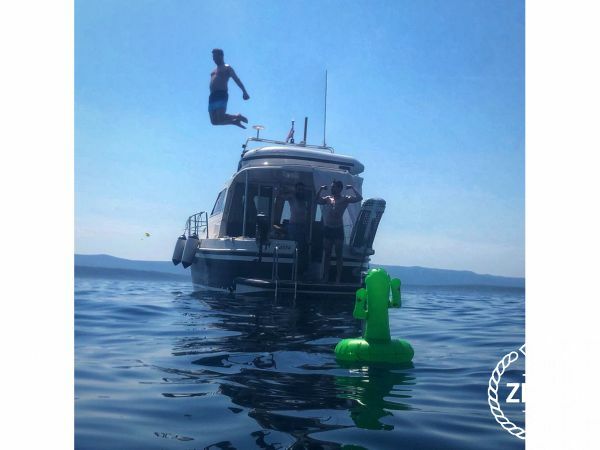 This boat is located in D-Marin Marina Dalmacija (Sukošan), and is ideal for a party boating adventure with friends or an exciting boat holiday with your crew. This motor boat is a luxurious and sleek choice for a perfect boat holiday exploring the beautiful coastline of Croatia. The Sas-Vektor Adria 1002 is a practical model that is stylish and perfect for your dream sailing holiday. The sea awaits, so start booking now! Toller Service vor Ort am Yachthafen. Das Charter-Personal hat sich große Mühe gegeben. Requested 148 times this week!